This is my daughter Abby M. White from Benton MO. 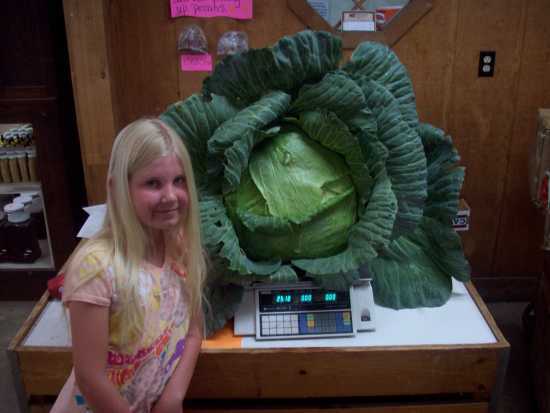 Abby just got out of the 3rd grade and this cabbage plant was started from a seed. She got the seed in class and raised the plant in school until it was about 4" tall and then they got to bring them home to plant in the garden. Abby goes to Kelly School in Scott County. The plant was harvested on Saturday June 20th and we took it to Diebold Orchard to be weighed in. The complete plant weighed 25.18 lbs and the head alone weighed 17.88 lbs.